ASL employs a wide variety of linguistic features that take advantage of its unique visual framework. One of the biggest challenges for interpreters is knowing when and how to apply these visual linguistic “tools.” We’ve learned and practiced visual linguistic features of ASL, like use of space and role shifting, but we often struggle to employ these in our interpreting. Participants will have the opportunity to “sharpen” their visual language tools! 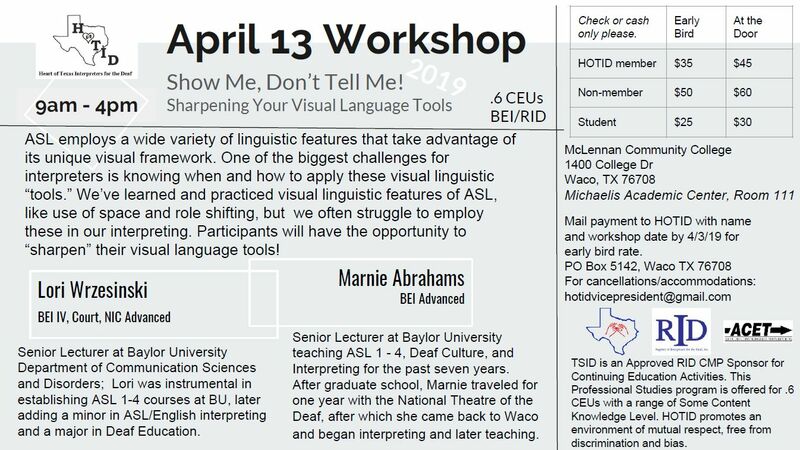 Senior Lecturer at Baylor University Department of Communication Sciences and Disorders; Lori was instrumental in establishing ASL 1-4 courses at BU, later adding a minor in ASL/English interpreting and a major in Deaf Education. Check or cash only please. TSID is an Approved RID CMP Sponsor for Continuing Education Activities. This Professional Studies program is offered for .6 CEUs with a range of Some Content Knowledge Level. HOTID promotes an environment of mutual respect, free from discrimination and bias. Mail payment to HOTID with name and workshop date by 4/3/19 for early bird rate.